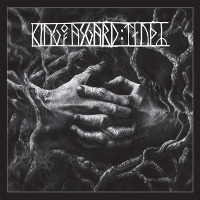 After having stumbled across “The Nine Worlds Burn” on YouTube back in 2012, I have followed the trajectory of Swedish Melodic Death/Viking Metal band KING OF ASGARD with interest. And after much anticipation, this year sees them back with their fourth full-length album since their formation in 2008, entitled “:taudr:”. With this admittedly brief release, KING OF ASGARD pick up right where they left off with “Karg”, although perhaps a slightly more pronounced hint of darkness seems to have been added. “:taudr:” wastes no time on intros or frills, but rather goes straight for the jugular. “The Curse and the Wanderer” launches right into the fray, with thunderous drums, a maelstrom of guitars, and penetrating vocals that rip through you like a scythe. Drum rolls and cleaner lamenting vocals temper the harder parts, whilst an sinister-sounding melody adds a more threatening undertow. Mellowing things out a bit, “Death… and a New Sun” sees an interesting folky melody leading us into the rolling mid-tempo song. Unexpected changes in the speed keep things interesting, whilst harsher vocals are complemented by chanted melodies. At the apex of the album we find the title song “:taudr:”, which starts off with a very catchy riff. Bringing to mind tales of setting forth on conquests, and overlaid with hints of melancholy for that what is lost in the process, this is a powerful song in which the guitars really come to the fore, leading to a very epic and victorious climax. I can well imagine that this song would be absolutely crushing live. “… for the Fury of the Norse” on the other hand takes on a slower and more ponderous melody. Featuring an onslaught of excellent drumming coupled with crushing riffs, it's a pity that this song errs slightly too much on the lumbering side. This is further compounded by the length: as the longest song on the album, this song seems to outlive its welcome somewhat. The final song, “Upon Raging Waves”, is a cover of MITHOTYN, a defunct Swedish Viking/Black Metal band in which Karl also played. This song stays fairly true to the original, starting off with soothing piano strains and being gradually joined by the other vocals, and swelling into a swirling melody that completely captivates the listener. The production of this album is well done, although the bass guitar does get lost occasionally. This aside, the mixing really ensures that the music packs that much more punch. Whilst the songwriting may perhaps not exactly be revolutionary, it doesn't need to be. “:taudr:” is a solid release, even if it might not be the crowning jewel of KING OF ASGARD's discography. Having said that, there is no one song that immediately stands out: all four are good, but not extraordinary. A further downside of this album is it's length: containing just four original songs and one cover, “:taudr:” spans just over half an hour. Given the overall epicness of this album, this brevity really leaves you thirsting for more. If you're looking for a ferocious Viking Metal album that isn't as over-polished as AMON AMARTH, this is worth checking out.